'Bambella: H&M Cat Dress, French Connection Watch and A Hair Transformation! H&M Cat Dress, French Connection Watch and A Hair Transformation! 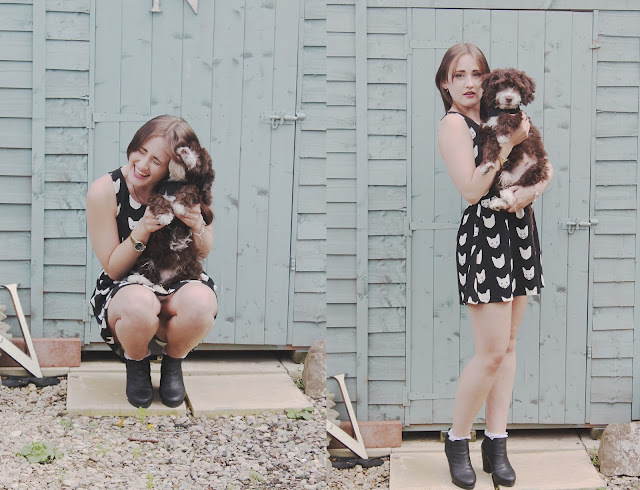 Meet Bertie, Jack's new little pup! This is the outfit I wore last week when I went to the Cheltenham Blogger Meet Up. I am so in love with this dress. I got it for it for my birthday from Jack a few weeks ago, it's from H&M and was only £14.99, which considering how cheap it is, it's incredible quality. It's such a lovely thick material so will be perfect for the colder months, and the fit is so flattering (if I do say so myself haha!). Now onto my new favourite thing. This gorgeous watch from French Connection came in the post a week or so ago and I've worn it everyday since (even if I am just in my PJs around the house!). At first I was a little disappointed as it is very light weight which makes it feel slightly worse quality than I thought it would have been considering the price. But actually once I had started wearing it, I am so glad of the weight now as if it were heavier, I think it would just become a burden and I'd wear it less. I am literally in love with it and would suggest for anyone who's looking for a special watch (but doesn't fancy spending £300+ on a Michael Kors one!) to take a look at French Connection's collection. Also if you follow me on twitter, facebook or youtube you may know about my hair by now. But if you don't, take a peek at the video below to see a little (read - huge) change I had! oh, wow, huge hair change! although it isn't what you wanted it really suits you, the colour is gorgeous! also, bertie is such a cutie! lovely outfit post, as always. I love this outfit, the boots especially ;) I love your new hair too, it's so cool! beautiful outfits and blog girl! I picked up the same dress this week! Adorable puppy! I am on blog hopping from blogaholicnetwork. Interesting post. Pinned your catty nails on my pinterest board! Ohh I love this H&M dress! Seen it in store a lot and had to resist buying it - the print is just ideal for me (crazy cat woman haha). Your watch is gorgeous too. Jack's puppy is so sweet!